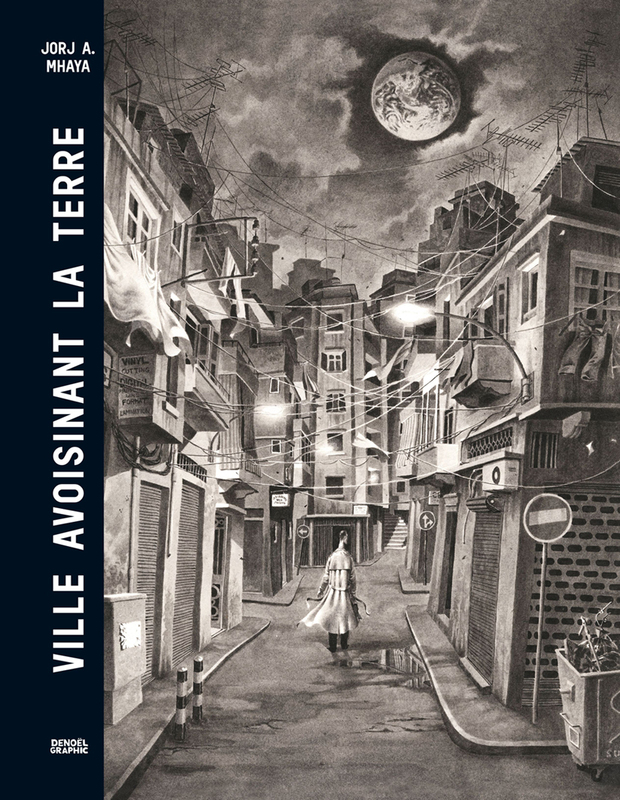 Taking a global view, there’s isn’t a hotter book right now than “Ville avoisinant la Terre,” by Jorj A. Mhaya. It was originally published in Arabic in 2011 by Dar Onboz. 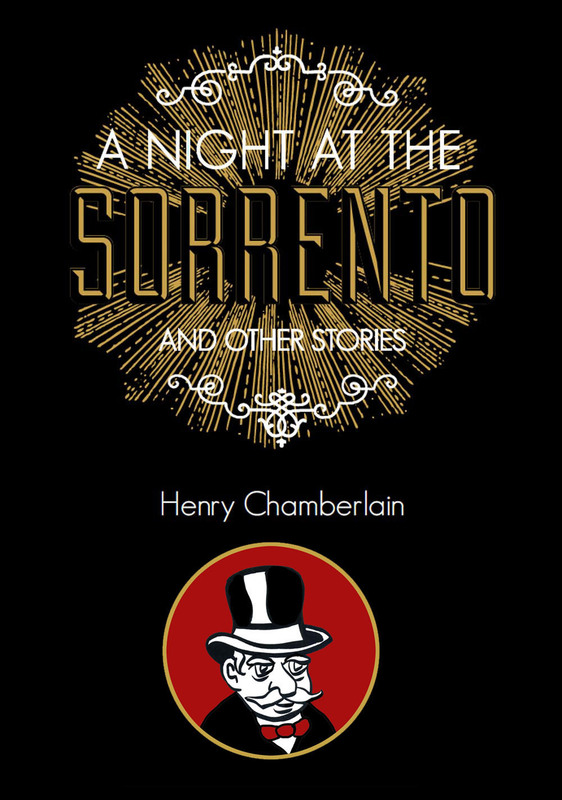 And it has been recently translated into French by Éditions Denoël. This is a gorgeous book and it is only a matter of time before there is an English translation. In the meantime, I would encourage you to seek it out now and get ahead of the pack. If you enjoy the convenience of Amazon, you can find it right here. Let’s take a closer look. Over years, I’ve enjoyed a number of comics in languages I don’t know well or at all. 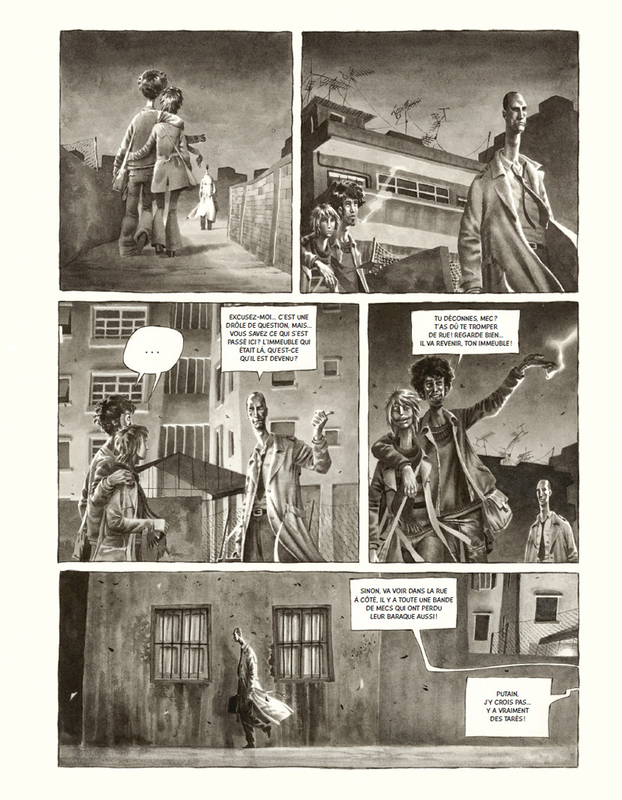 For example, you don’t have to know French to enjoy the artwork of Blutch or Tardi. And so it is with the artwork of Mhaya. 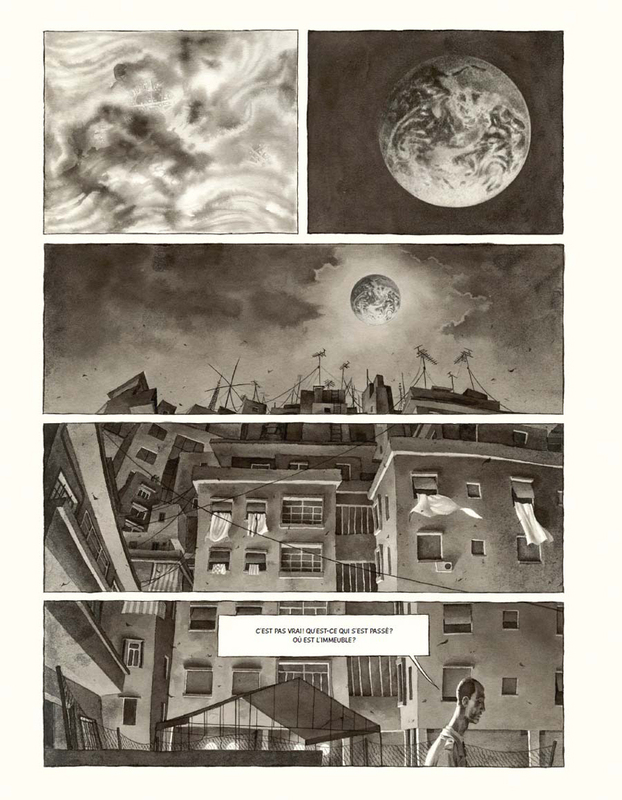 He has a wonderfully sensitive and expressive line punctuated by his use of China black ink wash.
A map for some context. 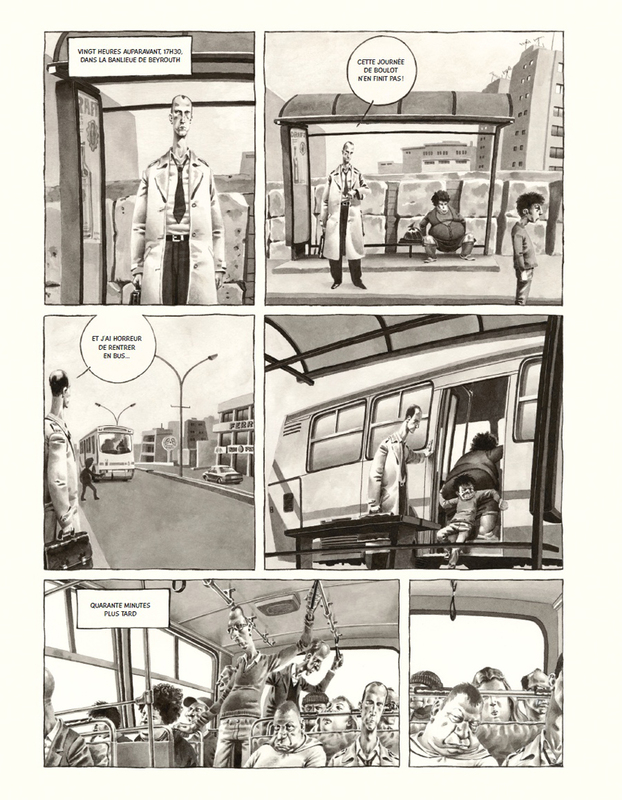 You will get much of the gist of the narrative by simply following along our main character, Farid Tawill, a typical office worker from Beirut. It may be evident from what you see but, just in case, this man’s world has been turned upside down. 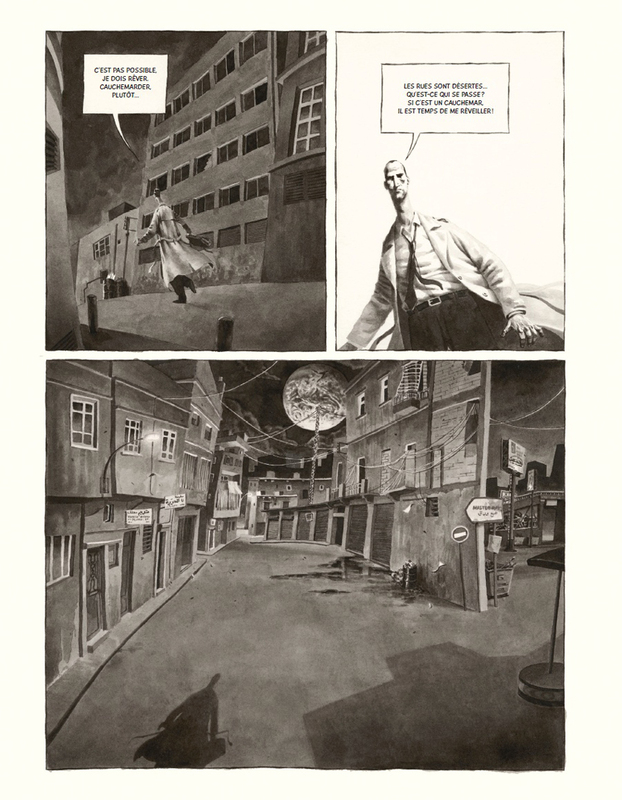 On his way home from the office, he finds that the apartment building where he lives with his family has disappeared. Further along his search, he finds his whole city as become alien to him. Like a character out of Kafka, or from an episode of “The Twilight Zone,” our hero appears to be in an alternate reality. Alienation is a favorite subject in art. Edvard Munch’s “Scream” series, first begun in 1893, is the most famous example. And it comes as no surprise that, over a hundred years later, we find Munch quite relevant–feel compelled to add more to the discourse on disconnection–and see how the world has forged some pretty heavy links. 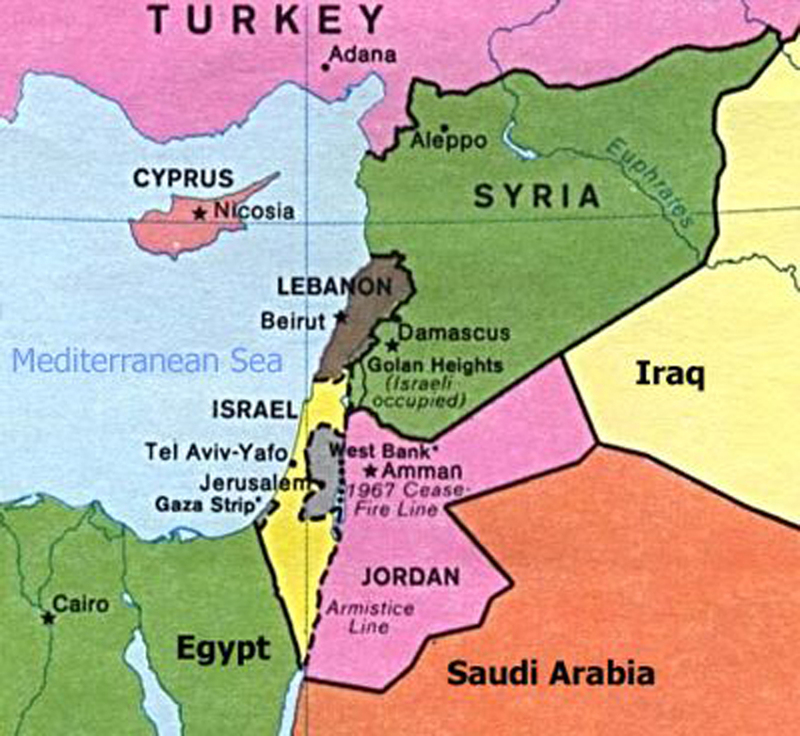 It’s not lost on Mhaya from his vantage point in Beirut. Mhaya wants you to feel the surreal quality to his homeland. 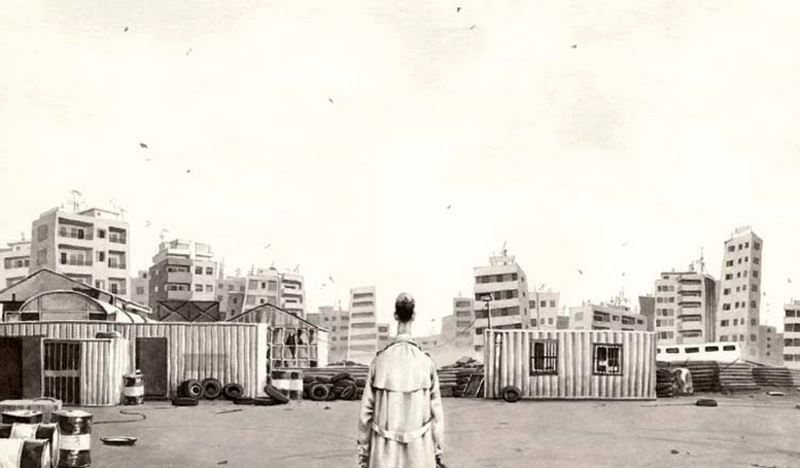 He has stated that he gained a lot of insight from the photojournalism he grew up with: the urgent black & white news photos during the Beirut civil war in the ’70s and ’80s help to inform his moody ink wash artwork. How much more absurd can life seem to be than to live in a perpetual war zone? No wonder Mhaya has an obese Batman character chasing our hero down the streets. What Mhaya has done with this book is set up a vehicle upon which to comment upon the absurdity of life, weaving back and forth from the specifics (his own experiences, views, and concepts) and the general human condition. This is what any great novelist, filmmaker, painter, etc. does on some level: set the stage and then perform. 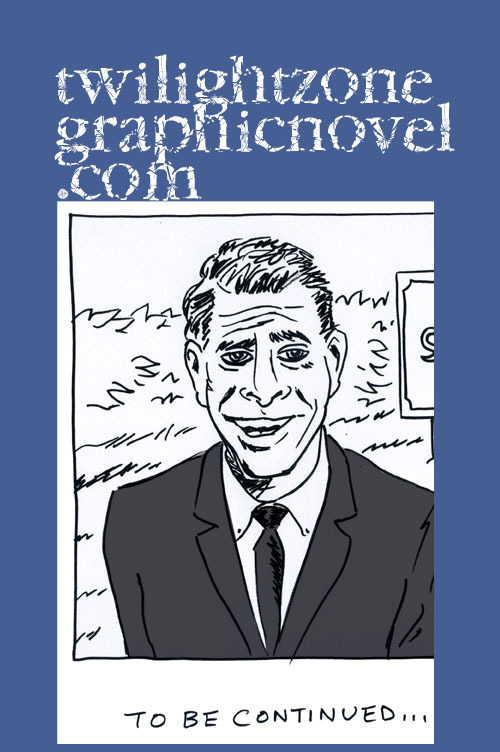 It is certainly a process well suited for a graphic novelist. So, you can see that you can do very well from just reading the images. Yes, you do want the text. In fact, you do need the text. But we can live with just the images. We see the little hooks that motivate the artist: everything from a close-up of a mangy dog to a close-up of a woman’s pretty feet. This or that panel do not just appear out of nowhere. The dog is a symbol of isolation. The feet are a symbol of release. It appears that our hero is forced to confront his life in every which way possible: philosophical, emotional, sexual, intellectual. He is not just in an alternate reality. He is in a place that forces him to experience a heightened sense of reality. His choices, what he learns, what he survives, will determine his fate. And here I am commenting up a storm and I’m only relying upon the pictures! 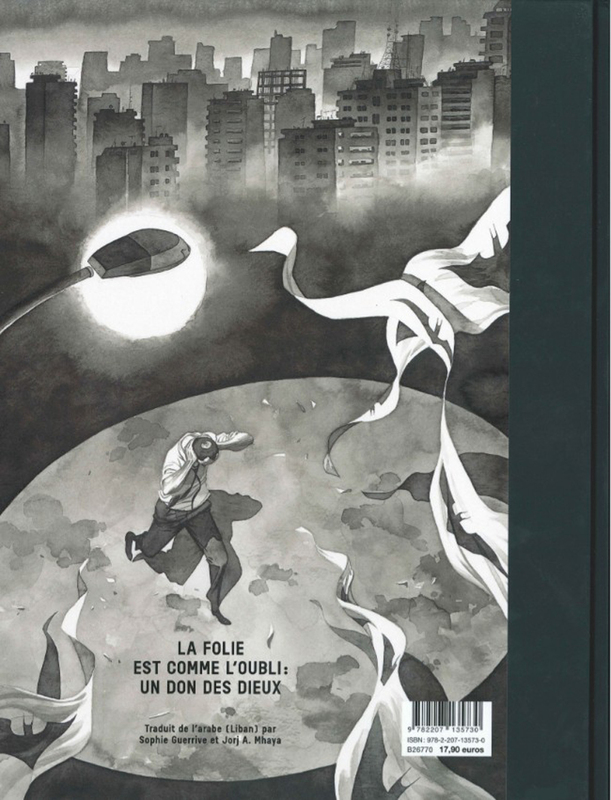 Well, it makes total sense that this book went first with a French translation in order to make the natural progression to being part of the prestigious Angoulême Comics Festival. And now English readers can’t wait to join in. The loose translation in English to this book is “City Neighboring the Earth.” I look forward to that title in the near future. 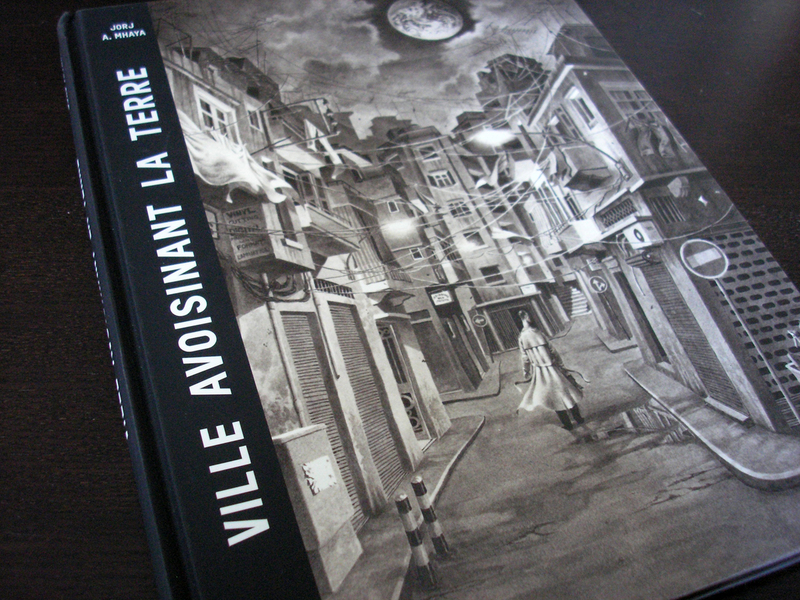 “Ville avoisinant la Terre,” by Jorj A. Mhaya, is an 88-page hardcover, black & white with tones, translated into French by Éditions Denoël. 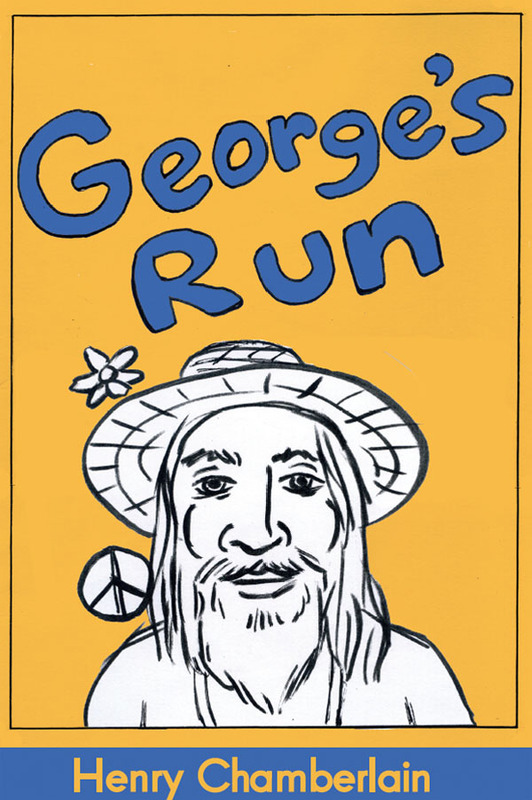 Find it at Amazon right here.